Villa Daniel is an old renovated stone house located on the edge of the village Babići, only 700 m from Kaštelir in central Istria. Situated on a small hill, the villa offers to its guests a breath-taking panoramic view on the surrounding hills covered by vineyards and the sea. The house was built in the year 1943 and it has been completely renovated in the year 2013. It is located on its own enclosed garden of 1000 sqm with a well maintained lawn. 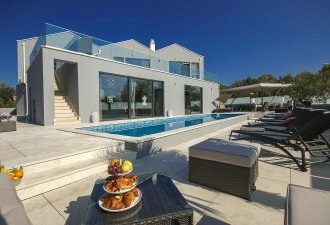 The guests of the house have access to an outdoor pool with sun loungers, outdoor kitchen with barbecue and a covered terrace with a large stone table with chairs and 3 parking spaces . The home owner does not live on the property . Villa with pool for 8-10 people of approximately 145 sqm in two separate accommodation units - houses. The first house has two floors and consists of an air conditioned ground floor where is a living area with kitchen, dining table and one person sleeping couch. At the first floor there are two air-conditioned bedrooms with double beds and shower/toilet. The 2nd house has a living room with kitchen, dining table and one one-person sleeping couch, two double bedrooms with double beds, shower/toilet. Sehr schönes und gut ausgestattetes Haus in ruhiger Lage, nur die Hauptstraße ist sehr nah, aber nicht so sehr störend. Perfekt für zwei Familien, mit jeweils eigenem Wohnteil und gemeinsamen Außenbereich. Dit was een prachtig huis. Zeer vriendelijke eigenaren. Heel schoon. Enorme mand met fruit als welkom. Is niet goedkoop maar wel waard!